Numerous scholars have noted various elements of literary structure in the Gospel of Luke, many of them patterned, such as chiasm. Several of these scholars have rigorously explored the significance of such structure. A common conclusion is that if Luke is consistent with other ancient writers, then the observation of some elements of patterned structure, e.g., what has already been discovered in the Gospel, suggests that there is probably considerably more. This book offers a comprehensive literary structure for the Gospel of Luke, thoroughly and critically evaluates it, and ultimately focuses on theology that may be derived from this structure. As groundwork, the Introduction provides rigorous tests for assessing the intentionality behind proposals of parallelism. The first chapter then employs the tests in an evaluation of Robert C. Tannehill's work on Luke-Acts, which is representative of studies on correspondences that are not strictly structural in nature. His contribution enables us to grasp how Luke encourages the reader to read passages in the light of other passages within the Gospel and, accordingly, provides an interpretive aid for our study. The second chapter applies the tests to the Lukan correspondences suggested by Charles H. Talbert, which are inherently structural. His analysis of Luke-Acts and other Greco-Roman literature provides a strong theoretical foundation for our own proposal. Chapter three surveys OT, Greco-Roman, and NT texts that bear a similar patterned structure to what we discover in Luke. The structure of Luke is presented and carefully evaluated in chapter four, and the theological implications of that structure are developed in chapter five, shedding much fresh light on Lukan theology. Luke's outline, and the structure of his central section in particular, continues to puzzle readers more so than with any other Gospel. McComiskey's proposals make reasonable sense of the outline, and significant theological applications result. - Craig Blomberg, Denver Seminary In the application of new methods of literary analysis to the New Testament the Gospel of Luke has proved to be a fruitful testing ground. Dr. McComiskey's thesis makes a significant fresh addition to this area of research with its penetrating study of the structure of the Gospel. This is one of the most original contributions to Lucan study of recent years. 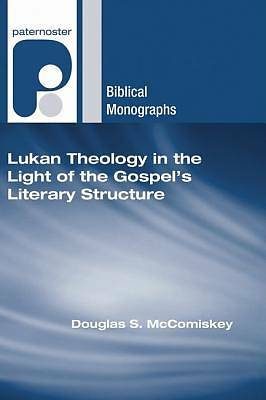 - I. Howard Marshall, University of Aberdeen Attention to structure is an important avenue into meaning, and McComiskey's study makes a serious contribution to the study of the structure of the Gospel of Luke. McComiskey establishes an extensive set of criteria for testing structural proposals, and applies them rigorously to his own proposal: his investment in rigorous testing is unparalleled in previous studies on the structure of Luke. Even those who are not finally persuaded by the structure in its entirety are likely to conclude that he is, nonetheless, onto something here. And McComiskey clearly lays out the kinds of contribution to meaning that his structure might offer. - John Nolland, Academic Dean and Director of Post-Graduate Studies, Trinity College, Bristol, UK Douglas McComiskey studied at Trinity Evangelical Divinity School, Illinois, and then served as a Baptist pastor in Western Australia. Subsequently he studied under the supervision of Professor I. Howard Marshall at the University of Aberdeen. After teaching at North American Baptist Seminary he took up his present position as Professor of New Testament at Ridley College, Melbourne, Australia.